Yesterday I attended the first *official* meeting of the Maryland Library Association’s Social Media User Group. The primary discussion focused around a panel of local library professionals who are active in managing library social media accounts. Throughout this discussion, several tools were mentioned for managing multiple social media accounts to create a cohesive presence across platforms. With many of the panelists singing the praises of “IFTTT” for managing content, and several attendees left wanting to know more, the site seems ripe for further discussion in the library world. “IFTTT” (pronounced like “gift” without the “g”) stands for “If This Then That.” It is a web-based service that allows you to create automatic connections between different internet applications. These applications, which IFTTT calls “channels,” currently include over 50 sites like Facebook, YouTube, and Delicious, as well as productivity applications like email and Google Drive. Once you’ve created your IFTTT account, you can activate any of the channels in which you have an account and would like to link to other applications. After activating channels, you will be able to create “recipes” to automatically link content across accounts or to automate activities you perform frequently. Recipes consist of a “trigger” from one channel that leads to an “action” in another channel. Want to archive your Facebook posts as a journal in Evernote? Or automatically post a link of your most recent blog post to your Facebook timeline? Create a recipe! 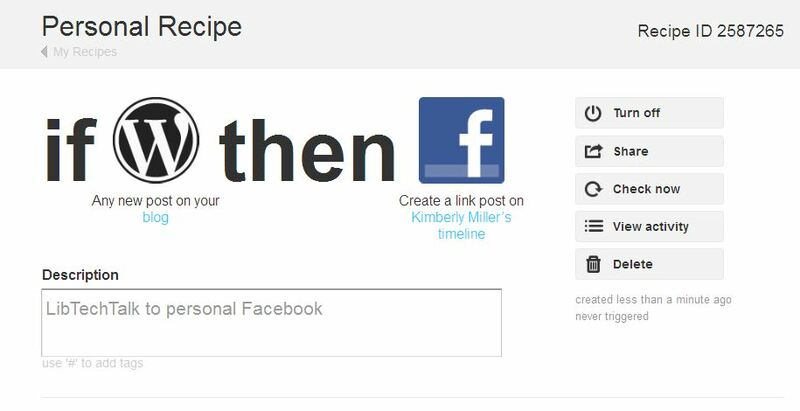 IFTTT gives you the option to set up personal recipes or share your recipes with other users. This means there are already several shared recipes set up for IFTTT channels that you can use or view as examples. 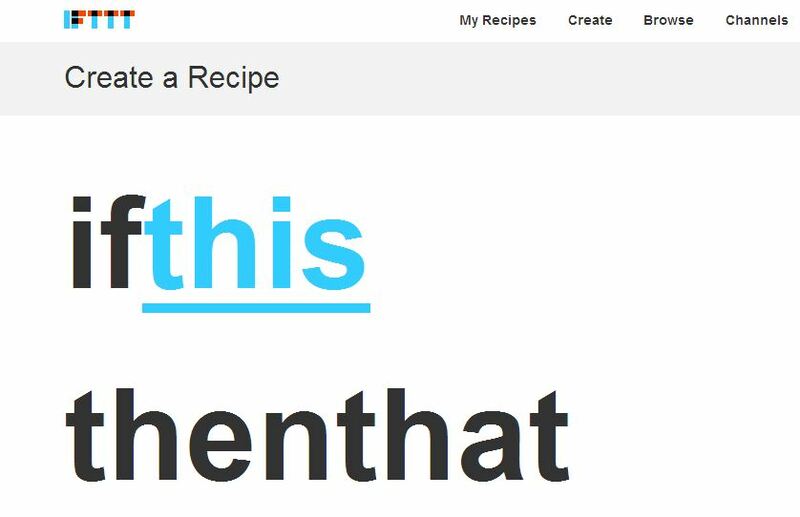 IFTTT leads you through creating a new recipe in a few simple steps. Let’s say I want all of our new LibTechTalk posts to automatically appear as links on my Facebook page. First, I select the channel that will initiate the trigger (or the “this” in the “if this then that” chain). Once I’ve selected a channel, I need to choose a trigger action. For this recipe, I’ll choose “Any new post” in the WordPress channel. This means my recipe will be “triggered” every time a new post appears on LibTechTalk. 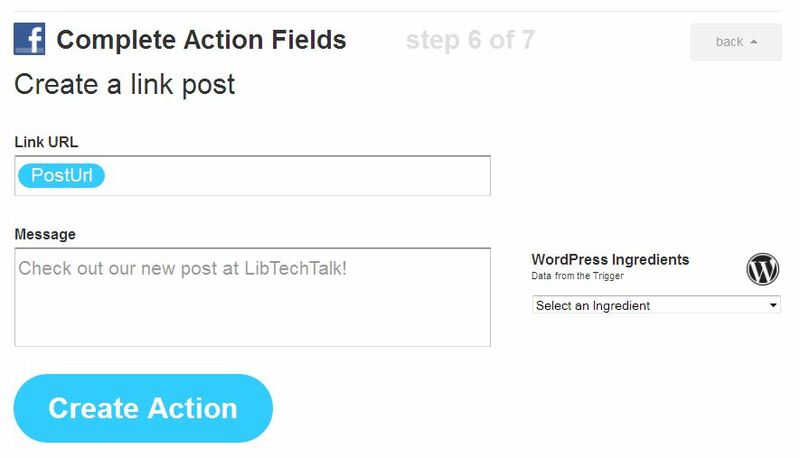 Choose “Any new post” in the WordPress as the recipe trigger. Next, I choose the channel in which I want the next action to occur (or the “that” in the “if this then that” chain). After selecting the action, I can customize how the post will appear in on my Facebook page. Finally, add in a description of the recipe and I’m done! I can also choose to share the recipe with other users, turn the recipe “off,” or delete the recipe altogether. Although IFTTT does not allow you to monitor any of the activity in your social media accounts, it takes some of the hassle out of linking activities and content across several different sites. You will still need to manage the spontaneous engagement that is so important in cultivating a vibrant social media presence, but IFTTT can help you automate the routine tasks you find yourself completing time and time again. 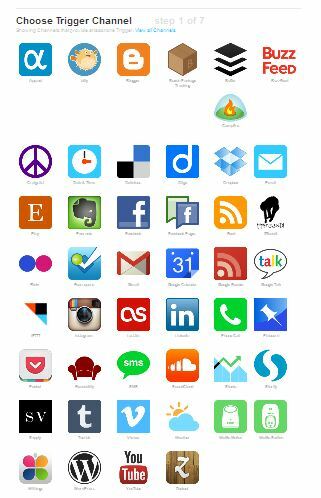 Best of all, IFTTT is free to use and can be accessed anywhere you have internet access. Ready to dive into IFTTT? How do you use IFTTT? Do you have any great recipes? Tell us in the comments!